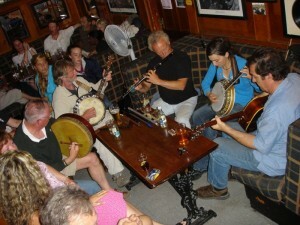 Doolin has long been famous for it’s traditional music. This is thanks to the present and earlier generations of musicians from the area. Most famous of this earlier generation was perhaps is the Russell brothers Micho, Gussie and Pakie. There is now an annual festival at the end of Febuary commemorating the brothers. In the 1960’s they brought their unique music to a world stage. Micho through television, radio and international tours made Doolin a household name . People travelled from all over the world to meet these ambassadors of Doolin. Ever since music has thrived here and this continues to this day. Four pubs (McGann’s, O’Connors, Fitz’s and McDermott’s) in Doolin have music almost all year round. Musicians both local and not so local play here nightly, every night is unique. All four pubs are within walking distance of us and taxis can be arranged if requested.